Well, these are addictive little devils! Sweet little sugar puffs that melt in your mouth, all dressed up for the Fourth of July. Trust me, you won’t be able to stop at one. I did something out of character and took the easy route with these treats. I’ve made meringues many times using egg whites, but I tried using Wilton’s meringue powder and it worked beautifully. I tried using my gel coloring but it didn’t stick to the bag at all. Maybe because it’s “squeezable” gel, so it’s thinner. Paste coloring worked fine. This is seriously so easy. The hardest thing you’ll have to do is get the stripes of color inside the pastry bag. I’ll give you some pointers, but the important thing to remember is that even if your stripes are wonky, the meringues will still look great. Makes about 30 meringues (1½ inch) or hundreds of little bitty ones. PREPARATION: Drop large star tip into the pastry bag. Fold down the top third of the bag (making a cuff) and paint alternating stripes of red and blue up the inside of the bag, starting at the base of the star tip and working up. Don't make them too thick or too close together, or you'll end up with purple! (I used 3 stripes of each color.) Set bag aside. Cover a large baking sheet with parchment. MERINGUES: For best results, use a stand mixer (or a sturdy hand mixer and medium-sized bowl.) Heat oven to 250 F.
Beat together the water and meringue powder until foamy. Add sugar very gradually, sprinkling it in a little at a time, scraping bowl occasionally. Beat until thick and shiny, about 5-7 minutes. Add flavoring if using and beat until incorporated. Place the prepared pastry bag inside a tall water glass. Carefully drop meringue into bag. Don't try to spread it, just drop it in there. Unfold the cuff of the bag and twist to close. Pipe meringues on prepared pan. Squeeze near the pan and pull up slowly, releasing pressure as you go. Aim for about 1½ inches at the base. The first few won't be very colorful, but they're still pretty. They won't spread and can be fairly close together. 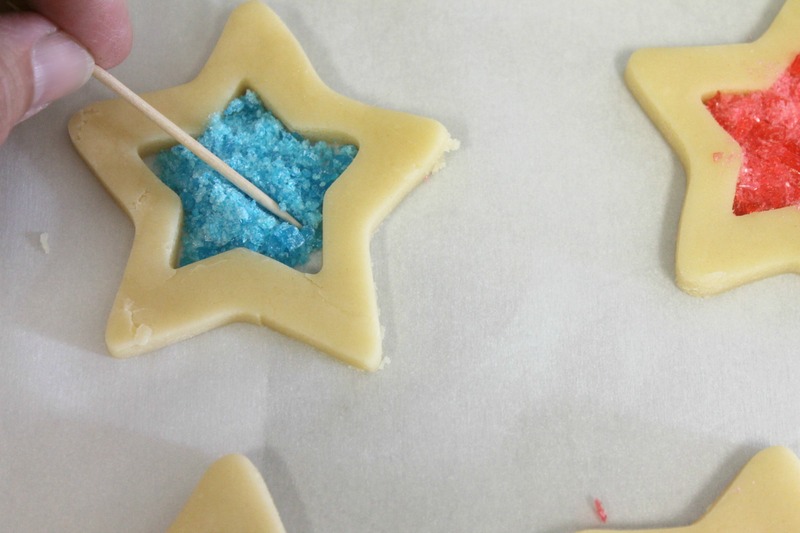 Small stars can be piped for decorations, but pipe them on a separate sheet; they'll take less time to bake. Bake large puffs for 25 minutes, (10 minutes for the tiny stars), then turn off oven (don't open the door!) and leave them for a couple of hours. If you have an oven that vents heat out when it's turned off, at the end of the bake time turn the heat down as low as it will go and let them bake for another 10 minutes before turning oven off. Store the meringues in an airtight container. Slooooowly add sugar to water and meringue powder. Beat until very thick and shiny. I place the cuff over my hand and very (very) carefully paint the lines. I was pretty generous here and had some vibrant colors. I used less on the second batch and they were still bright and pretty. Here’s what it looks like before the meringue is added. Place bag in glass for support. Carefully drop the meringue into the bag. Take your time when adding the sugar. Give it time to dissolve. If you want to make the tiny stars (great for decorating cupcakes) hold the tip a little bit above the parchment and start squeezing as you push down and touch the sheet. Stop squeezing and pull up. You’ll get the hang of it! To make both sizes, put the large puffs in the oven first. Let them bake for 15 minutes, then put the other sheet in too. Continue to bake for the remaining 10 minutes then turn off the oven without opening the door. Don’t peek – leave them to dry out for a couple of hours (or overnight). If you have an oven that vents the heat once it’s turned off, see the recipe for instructions. Put a dot of meringue batter on the baking sheet under the parchment to hold it in place while piping. If you want a little more white and a little less color in your meringues, just make 4 stripes instead of 6 inside the pastry bag. Keep them dry, cool, and dark. In theory, they’ll last 2 weeks. I don’t think they’ll have that opportunity! Piped and ready for the oven. Jazz up strawberry shortcake, cookies, cupcakes, or a bowl of ice cream. Or just pop them—one after another—in your mouth. Have a sweet and safe 4th! Each month a group of crazy food bloggers gets together to make theme-related recipes. This month we’re running with a rousing patriotic Red White and Blue theme! After you’ve read this post, click on the links at the bottom of the page to see what the other gals have come up with. There are still a few to come, so check back every morning for the latest creation. Can you hear the John Philip Sousa march playing in the background? Smell the burgers on the barbecue? See the kids lined up at the fireworks stand? Independence Day is right around the corner, and do I have a fun recipe for you! Kids will love to help with this one. 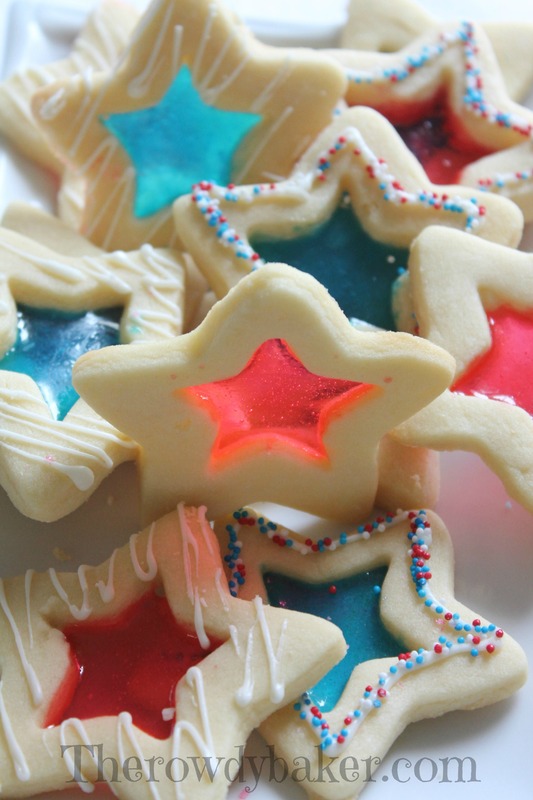 Presenting…Star Spangled Cookies! I used cinnamon Jolly Ranchers for the red cookies. You’ll find lots of hard red candies to choose from, and may prefer cherry or strawberry flavors. Your biggest challenge will be finding hard blue candy. I used Dum Dum suckers from the dollar store, but found that there was blue and then there was blue. My first batch turned green when they baked. Apparently blueberry flavored suckers held their color, and blue raspberry didn’t. I recommend that you test one or two cookies first, just to be sure they’ll turn out a nice, patriotic blue. Red white and green just doesn’t have the same impact. Unless you’re Italian. The other option is to make your own hard candy. It’s really very easy to do. 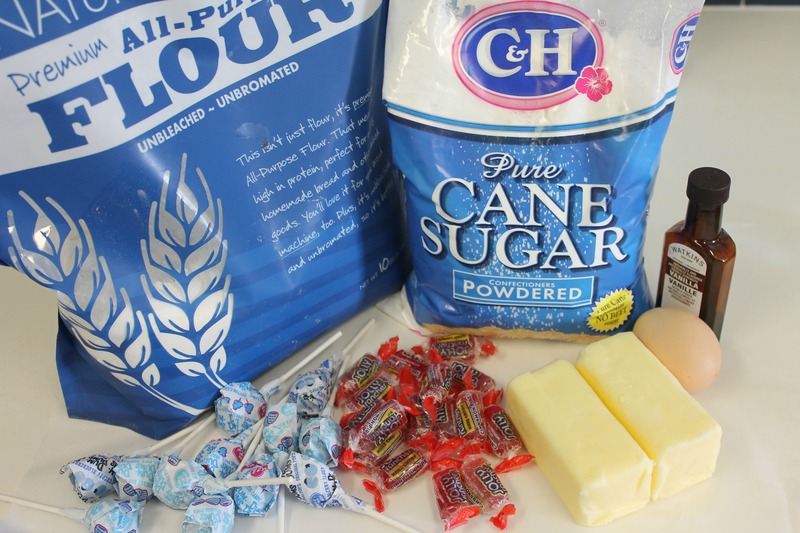 Here’s a simple hard candy recipe from Lorann Oils. I would recommend making the candy, letting it harden, and crushing it. Pouring hot candy into the small star centers would be very tricky. If you have better hand-eye coordination than I do, you might be able to pull it off. I’d make a mess of that! Whoops…did I say two options? I have one more, though it’s a little artsy-fartsy. I think it’s pretty, and you could mix colors this way too. Bake your cookies and as soon as they’re done, add the crushed candy. The heat from the cookie and the baking sheet will partially melt the candy. It won’t be smooth and flat, but as long as the candy is touching the sides of the cookie in a few spots, it will stay put. Kind of interesting, huh? I used a strong freezer bag and a hammer to crush my candy. It worked like a charm and got some of that aggression out! The cookie itself is a sturdy shortbread. If you have a favorite sugar cookie recipe that doesn’t spread too much, that would work well too. You’ll need two star cookies, one large and one smaller. Here’s my recipe and easy instructions. Festive, summery shortbread cookies with a stained-glass candy window in the center. Makes about 36 cookies, depending on the size of your cutters. For decorating: ½ cup white chocolate chips, sprinkles, nonpareils. In a large bowl (a stand mixer is best) beat the butter and powdered sugar together until creamy. Add the egg yolk, vanilla, and salt. Mix well. Add the flour and cornstarch. Mixture will be stiff - switch to a dough hook or stir by hand if necessary. Cover and chill for one hour. Roll dough out to ¼-inch thickness on lightly floured surface. 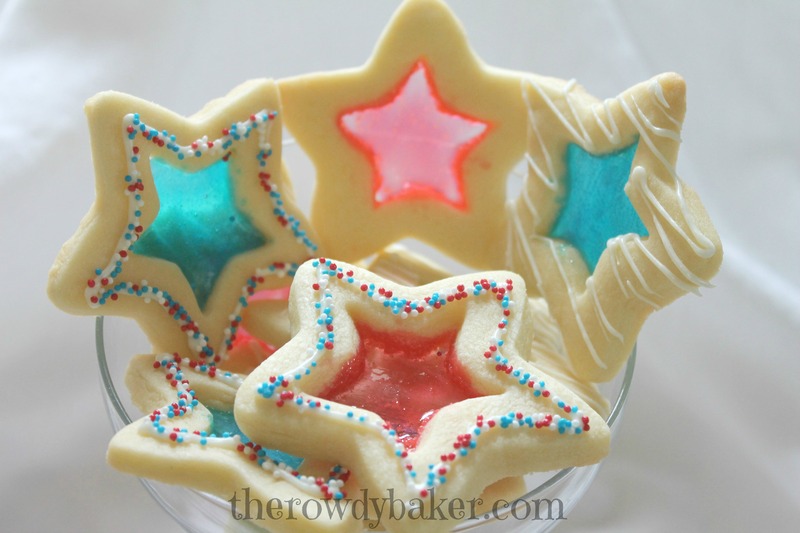 Using a large star cookie cutter, cut out stars and place them on parchment-lined cookie sheets. 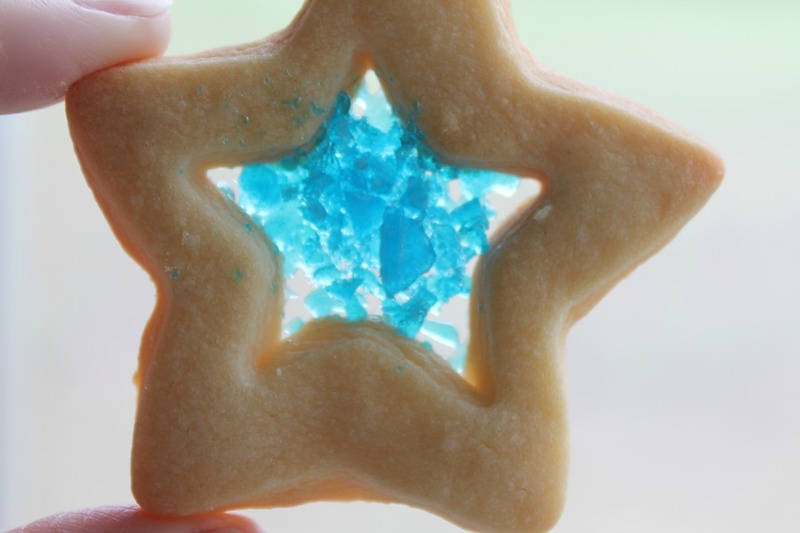 With small cookie cutter, cut a star out of the middle of each. Bake for about 10 minutes. Place baking sheets on cooling racks and let the cookies cool completely. Drizzle the cookie with white chocolate or royal icing if desired, and sprinkle with sugar decorations. Just think of how pretty these will look in a basket on your picnic table this Fourth of July. They’ll be a hit with young and old alike. Now strike up that band and march over to these blogs to find some other great recipes! Devilish Buffalo Eggs From Tampa Cake Girl. (deconstructed) Berry Pies From An Affair from the Heart. Double Decker Patriotic Pizookie From Cooking From a Stay at Home Mom. Berry Pound Cake From Moore or Less Cooking Blog. Red, White (chocolate) and Blue Trifles From Aunt Bee’s Recipes. Red White and Blue Berry Poke Cake From Crumbs in My Mustachio.